My cute little boy just turned one last week and we had a train birthday party for him. Now, there aren’t many people that remember very much about when they were one… so, honestly, this was more of a get together for the adults and an excuse for me to make a cake (or two…)! We didn’t do a big fancy to-do or anything, just grilled burgers, hot dogs, and chicken. P.S. The chicken will be the next Tasty Tuesday and it is TO DIE FOR! Just a sneak peek. Anyway, we had salads (potato, fruit and pasta), a veggie tray and corn on the cob. It was yummy! 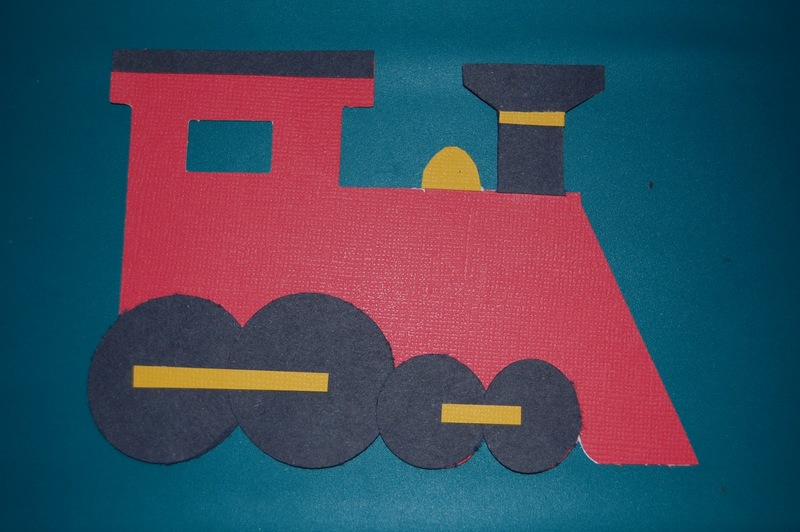 The Invites: I designed and cut out steam engine shapes that I then proceeded to decorate with construction paper. 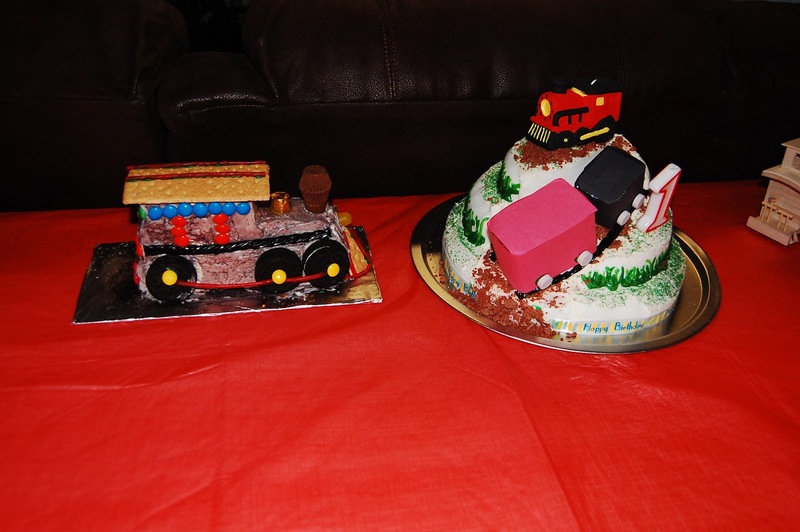 They turned out pretty cute, if I do say so myself. 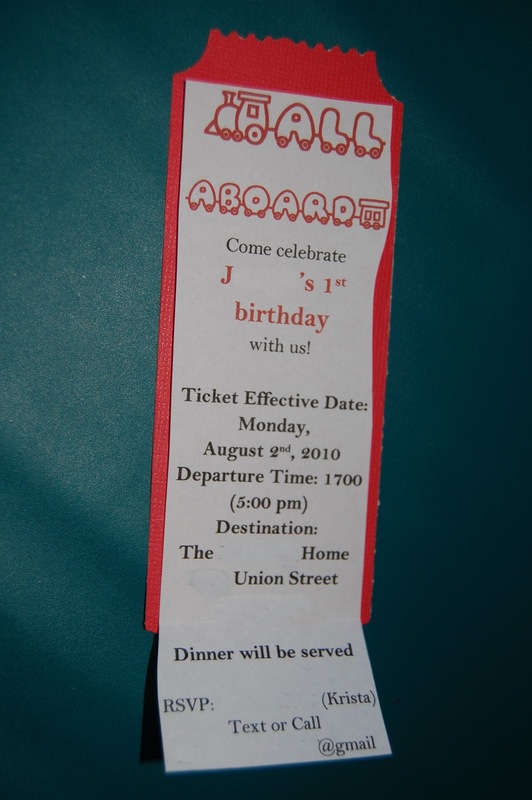 Then I cut out enough “raffle tickets” for each engine and made up a train ticket with all the party information on it. 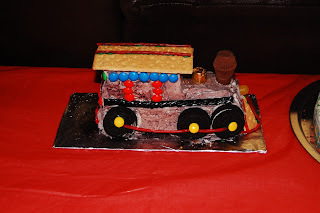 The train engines weren’t all exactly the same, but you get the idea. The tickets I put all the info on. Convenient for me, we just happen to live on a railroad themed road name. Sorry for all the white outs on the invites… but this is the internet and there are some crazies out there! The prep: Mostly the prep was getting all the food bought and ready for dinner. 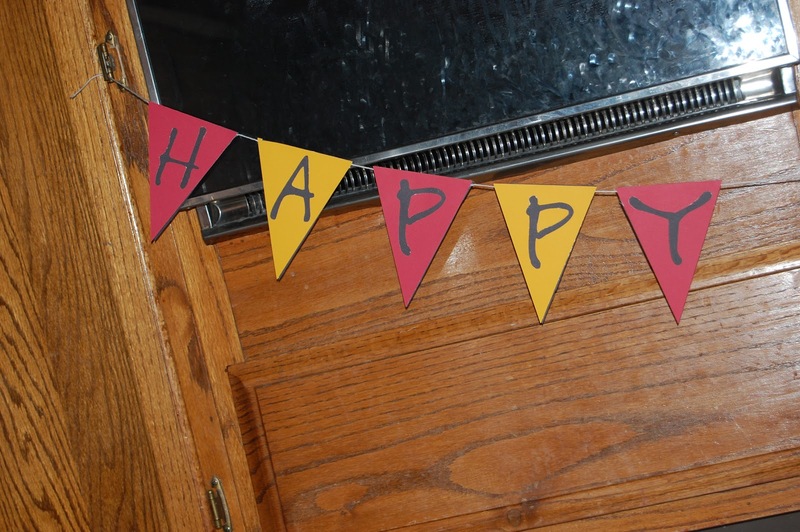 I did make a cute little banner… that I forgot to put up. But I’ll show it to you anyway. I did spend the time to make it, so I guess I may as well show it off a bit. 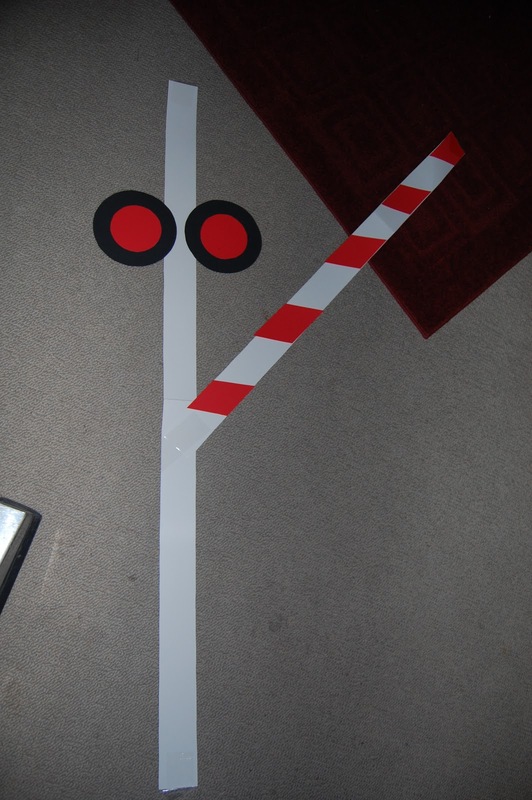 I also made some railroad crossing arms out of poster board. I had intended to make some yellow RR crossing signs… but I ran out of time. I was just working with nap time after all, and the little cutie was cutting them a little shorter than normal last week. Of course, I used balloons too. I also had the intention of putting up streamers… but ran out of time for that as well. 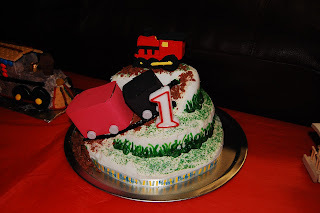 The cake was also a big part of the prep and since I had some issues with my fondant it went A LOT slower than I had hoped. Oh well, live and learn, yeah? 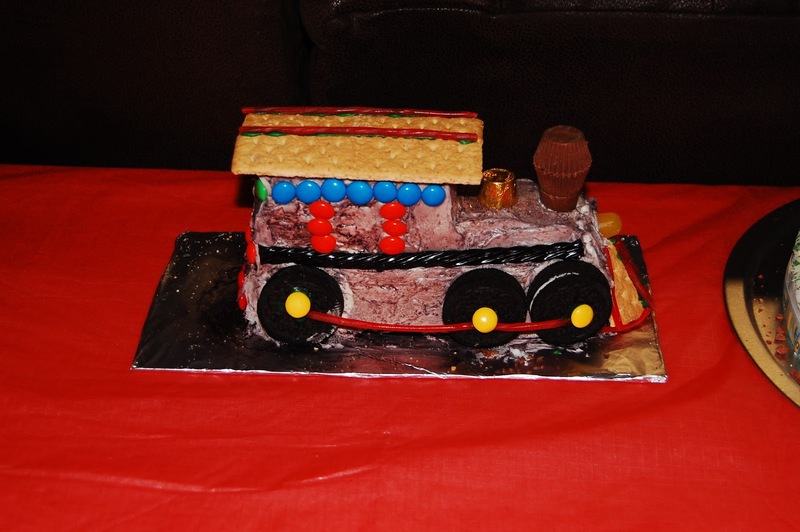 Another super cute idea I had that didn’t materialize: cute train-shaped sandwiches. Make the sandwich and then use a cookie cutter to get the shape you want. Adorable. 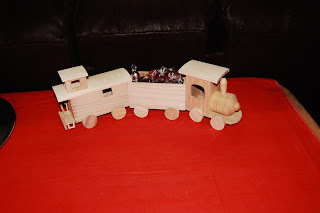 I also found this super cute wooden train at Michael’s. I will eventually stain it, but I didn’t feel like I needed to add that stress to my plate too. Best part: I got if for more than 50% off! Score! I mean Woo-Woo! Make sure you have any other supplies you’ll need… such as: plates, cups, utensils, and the like. Not fun to have people show up and realize you don’t have anything to feed them on. Also, not fun doing dishes for 20 people later… I didn’t forget them for this party… but I have forgotten them in the past. Not Fun! Clean up was pretty simple. 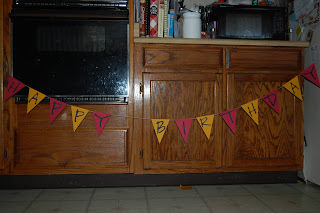 Pop the balloons and discard, take down tables and chairs, put away food, take down RR arms (and set aside to take a picture of later because it was dark when you did the clean up phase…). Ta-Da! All done! 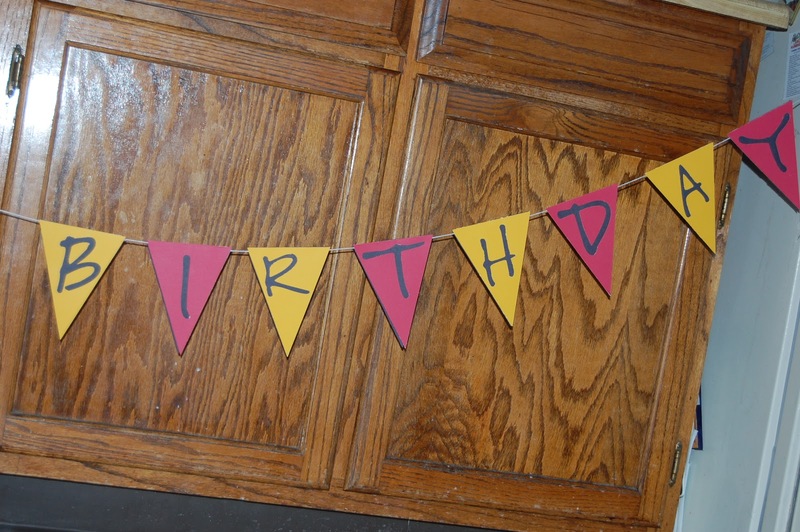 One successful birthday party down, 17ish more to go… for this kid anyway.